Fruits Basket Manga Volume 7 begins with Tohru spending time with Kisa Sohma, who has become attached to her. 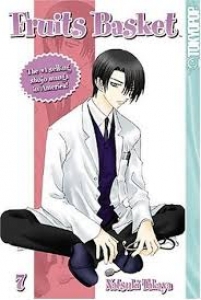 Hiro Sohma becomes jealous because Kisa doesn’t spend time with him and confronts Tohru about it. Zodiac while still keeping the story interesting and not letting it become too predictable.. I really enjoy this manga series because all the characters are unique and interesting and they have their own personalities. I enjoy this series because it’s nice and sweet. I enjoy this series and I don’t really read a lot of shojo manga, which is aimed at girls, and even though I am of that target audience I haven’t really found stories in that genre that have interested me except Fruits Basket. up and enjoy it. It’s definitely worth reading and if you liked the anime Fruits Basket, you’ll enjoy the manga a lot more. Fruits Basket is available from TokyoPop and has been finished by Natsuki Takaya, and is available only at Amazon.com, RightStuf.com or you can see if it’s available at your local library. This is one of the best manga I have ever read. It really touches the heart. I highly recommend this for people who likes to reflect on their inner feelings and wants to get insights on sadness, loneliness and how it affects people. Tear jerker.